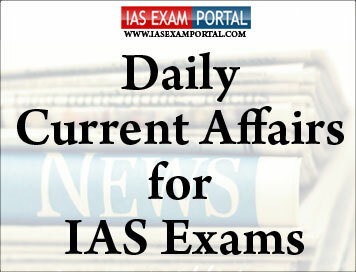 Current Affairs for IAS Exams - 28 August 2018 | IAS EXAM PORTAL - India's Largest Community for UPSC Exam Aspirants. The Election Commission of India, comprising Chief Election Commissioner Sh O P Rawat, Election Commissioners Sh Sunil Arora and Sh Ashok Lavasa, today held in depth interactive session with all the recognised national and state political parties on a broad range of issues concerning various aspects pertaining to Elections. The Commission considers Political Parties as the most important stakeholders in its endeavor to strengthen electoral democracy. The Chief Election Commissioner further observed that the Commission is uniquely privileged and honored to enjoy trust and confidence of people, media and all political parties because the Commission has an open door policy treating all with respect, impartiality and fairness. The Chief Election Commissioner mentioned about the challenges faced by all the democracies globally in view of the new media and advancements in information technology. He said the Commission is taking initiatives to prevent such interference. The Commission sought suggestions and support of political parties to comprehensively meet these and other challenges for ensuring free and fair elections. Some political parties requested the Commission to fix a certain percentage of VVPAT slips-counting to enhance the trust in EVM. Commission assured them that it is being looked into with the expert inputs of Indian Statistical Institute. Commission also informed that any candidate may approach the Returning Officer concerned for the specific count of VVPAT of a Polling Station under the law already available. Drones, their operators and pilots will have to be mandatorily registered on aviation regulator DGCA’s online portal, effective December 1. The use of remotely piloted aircraft, a kind of drone, is allowed for taking photographs, conducting surveys such as for laying of pipelines and agricultural purposes and surveillance, as per the regulations on remotely piloted aircraft system unveiled by the Ministry of Civil Aviation on Monday. Users will have to go online to seek a unique identification number for each drone as well as an operator’s permit licence.They will have to provide details of flight path to be undertaken for every flight. However, nano drones are exempt from all these pre-requisites. Drones are barred from being flown near airports, international border, coastline, Parliament, Secretariat complex in State capitals, military installations and eco sensitive zones. The DGCA will also be connected to district police officers and will inform them about drone flights cleared by it,” Secretary, Civil Aviation Ministry, R.N. Choubey told a press conference. Drone users are also advised to keep the local police informed of flights planned by them. The Minister of Petroleum and Natural Gas & Skill Development & Entrepreneurship ShriDharmendraPradhan today launched an online portal for enabling easy, efficient and transparent booking of Common carrier capacity for natural gas transmission services under GAIL’s pipelines. It would be a first step to facilitate gas trading on hub or exchange traded platform in India. He said that the policy reforms in last 4 years have helped in increasing the production and import of gas multi-fold in the country. The Government is focusing on the clean fuel, and for this purpose the gas import contracts have been renegotiated, bio-CNG is being promoted, and PNG supplies will soon reach new Geographical Areas. The portal should enable the new entities to utilize the GAIL’s infrastructure in procuring the gas in a cost-effective manner. The Minister said that the portal will act as a milestone in expansion of gas marketing, without human interface, through digital means. He said that the company has been providing third party access to pipelines since 2004 and over 100 consumers, small and big, are routinely being serviced at any time, for the last few years. Union Minister of Commerce & Industry and Civil Aviation today chaired a meeting of different exports stakeholders and Commerce Ministry officers to discuss a strategy for revitalizing India’s exports and doubling the country’s exports by 2025. The Minister said that this is necessary in view of challenges like uncertainty of global trade, rigid approach of banks affecting availability of credit, high logistics cost and productivity standards and qualities. India had acceded to WTO’s TFA (Trade Facilitation Agreement) in April, 2016 and action plan containing specific activities to further ease out the bottlenecks to trade has been prepared. To facilitate transparency through Ease of Doing Business and IT initiatives DGFT and SEZ have been online integrated with customs ICEGATE and mandatory documents required for exports and imports have been reduced to 3 each. The Commerce Minister said that apart from traditional markets India must also look at boosting trade with smaller countries and explore new territories like Africa which has 54 countries but accounts for only 8 % of exports from India. The Minister exhorted exporters to not miss the opportunity presented by China’s consumer market and make the most of the world’s mega import expo being held in China in November, 2018. Iran on Monday demanded the UN’s top court to suspend U.S. nuclear-linked sanctions against Tehran, accusing Washington of plotting its “economic strangulation”. Mr. Trump says the sanctions are needed to ensure Iran never builds a nuclear bomb. But Iran’s representative Mohsen Mohebi branded them “naked economic aggression”. His team of lawyers told the court in The Hague the measures were already devastating Iran’s economy and threatening the welfare of its citizens. The sanctions target financial transactions and imports of raw materials, cars and aircraft among other things. A second wave of punitive measures is due to hit Iran in early November, targeting its vital energy sector including oil exports. China on Monday called India its “natural partner” in the Belt and Road Initiative (BRI) and advocated better ties between New Delhi and Islamabad within the Eurasian framework. At a media conference on the BRI, Zhang Jun, China’s assistant minister of foreign affairs threaded India and China’s deep bonds established during their far history with recent diplomatic initiatives, including the Wuhan summit in April between Prime Minister NarendraModi and Chinese President Xi Jinping. Separately, the Chinese Foreign Ministry on Monday welcomed India and Pakistan’s joint participation in a Eurasian counterterrorism military exercise under the framework of the Shanghai Cooperation Organisation. A historic flight powered by indigenously produced aviation biofuel based on patented technology of CSIR-IIP Dehradun was flagged off today from Dehradun airport by Uttarakhand CM ShriTrivendra Singh Rawat. The Spicejet flight, featuring a latest generation Q400 aircraft powered by ,was received at Delhi airport by Union Ministers. Dr Harsh Vardhan, Hon’ble Minister, S&T and Vice President, CSIR on the occasion said that it is a historic day and the biofuel technology is going to be a game changer as the Biojet fuel is greenhouse gas neutral, carbon neutral, reduces air pollution and to cap it ,it would bring down import bill on crude oil.“Commercialization of biofuel promises large-scale employment avenues both in formal and informal sector”, said Dr.Vardhan. With this maiden flight India joins the exclusive club of nations using biofuel in aviation.The use of bio jet fuel, apart from reducing greenhouse gas emissions by about 15 percent and sulfur oxides (SOx) emissions by over 99 percent, is expected to provide indigenous jet fuel supply security, possible cost savings as feedstock availability at farm level scales up, superior engine performance and reduced maintenance cost for the airline operators. Committee of Administrators (CoA) chairman VinodRai said here on Monday the BCCI had 90 days to comply with the Supreme Court directions. He added he would hand over the administration once the new body was in place. “We (CoA) are happy with the final order of the Supreme Court. There is a timeline to implement the order and that has been reached after hearing all the stakeholders involved. Rai also said guidelines would be posted on the BCCI website regarding the recruitment of players in the new Ranji Trophy teams. She started her Asian Games singles journey very shakily a few days ago but now P.V. Sindhu is just a step away from gold and glory.She is the first Indian to enter an Asiad final. Sindhu overcame a mid-match lapse of concentration to defeat Japan’s Akane Yamaguchi 21-17, 15-21, 21-10 while SainaNehwal was left confused by Tai Tzu’s end-game strategy and lost 17-21, 14-21 in the semifinals.